.. resources to analyze patterns and trends .. how to improve K-12 education opportunities and outcomes? How might the K-12 improvements impact your community? Higher education? What resources and methods can be used to better understand where we are … and where we are going? How can we use data to better understand patterns, where and how change will occur … and how change will impact us? Have we got the best/right data to answer the right questions? Data Analytics can help K-12 schools, school districts, leadership and stakeholders answer these questions and better achieve visions and goals. 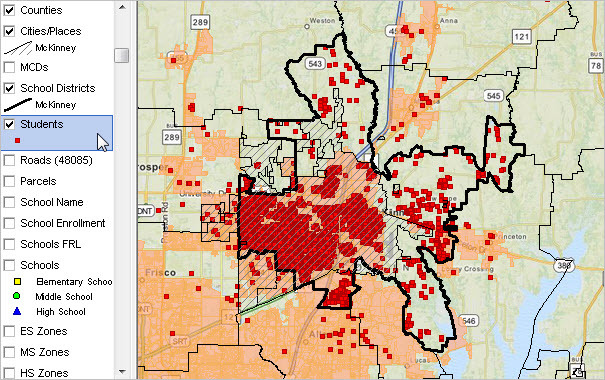 The ProximityOne Data Analytics team develops the GIS project and related datasets. The software and data are electronically installed on the school/school district/community computers. Knowledge of how to develop the datasets and GIS project are not required by school/school district staff. Specialized staff are not required to operate the software, use the GIS tools and data or perform data analytics applications. Having staff available with these skill sets can extend productivity and results from use of the resources. 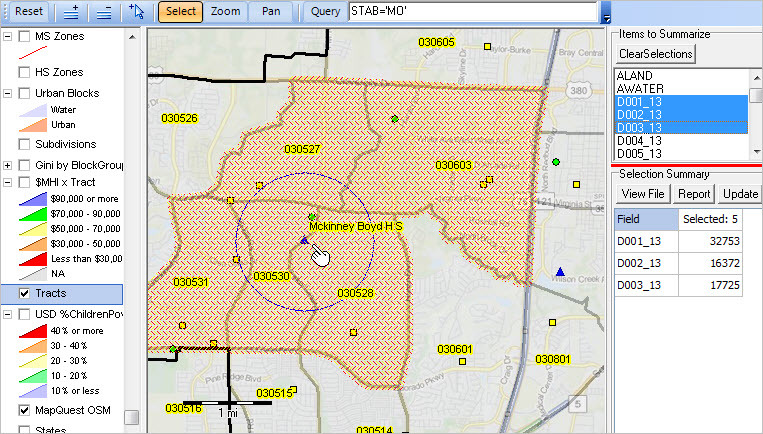 McKinney ISD shown with bold black boundary. McKinney city shown as hatched area. 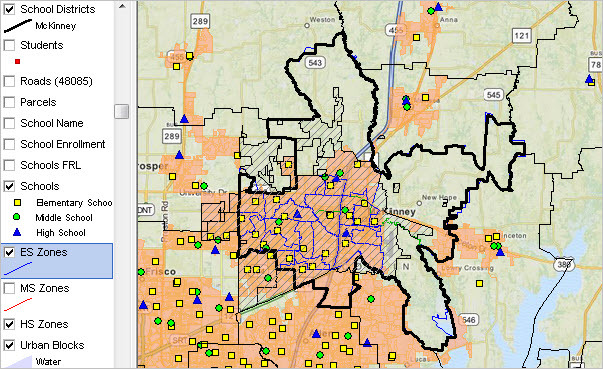 Urban census blocks: orange fill pattern; understanding urban/rural status of geography important for many reasons. See more about K-12 schools and urban/rural geography. See school by type/level in legend at left of map. View, compare, query, rank K-12 schools of interest using this interactive table. Extensive school level data are integrated and accessible but not shown in these views. Student markers/locations are added to the GIS project by first geocoding the student address data. 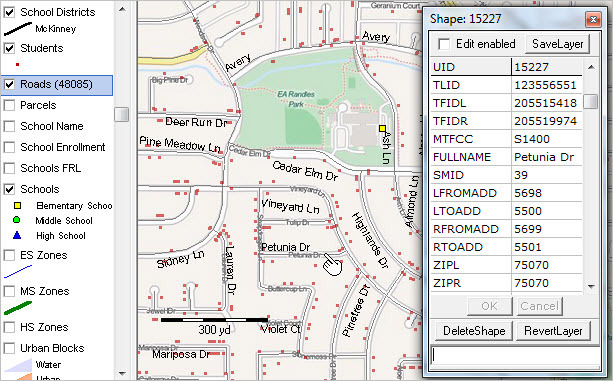 A shapefile is created and added to the GIS project. Extensive student level data (demographic, performance, other) are integrated and accessible but not shown in these views. Optionally place a query on the students layer to view/analyze those meeting a certain condition such as attending a specific school, enrolled in a certain grade/grade range, having specified test results, etc. See ES Zone layer (blue boundary) at left in legend panel; choose any/all zones. 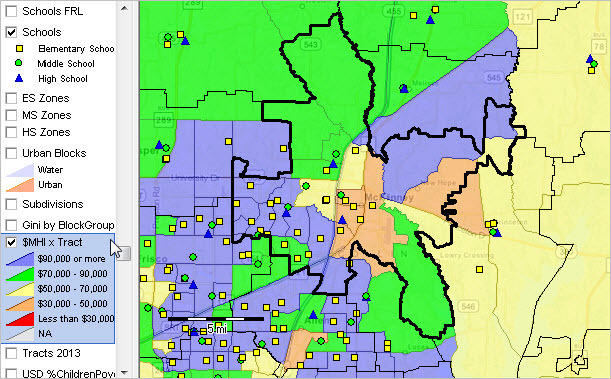 School zone boundaries can facilitate analysis of students attending associated school. The GIS project can facilitate analysis of alternative redistricting plans and enrollment distributions change. 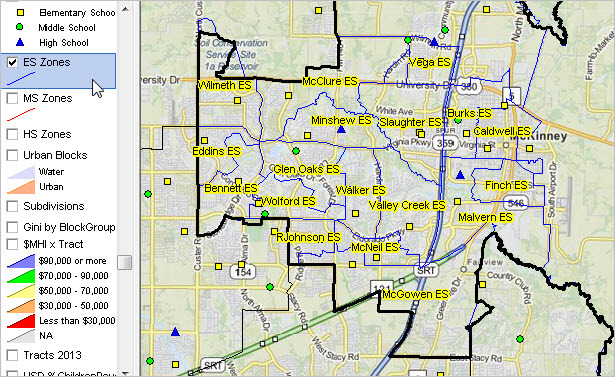 ES Zones labeled with ES Zone name; census block layer turned off (unchecked). The ability to easily navigate across geography or add detail can create visual pattern analysis not possible using tabular data. Using the Site Analysis operation, a query placed on student layer so only students attending this school are shown (red markers). The CV XE Site Analysis tool used to select a small group of students (cross-hatched in circle). See summary in grid at right; total students 51; 5 students are Hispanic. In the grid, the total number of students is shown with the name “Weight” — the field name of the database item used to dynamically total/sum/count the number of students. In this example, the value of the weight field is always 1 (thus when summed it shows the total number of students). The field could be set to values varying by individual student for a measure such as performance or participation. Counting all students enrolled in Walker ES; 532 students; 69 Hispanic. 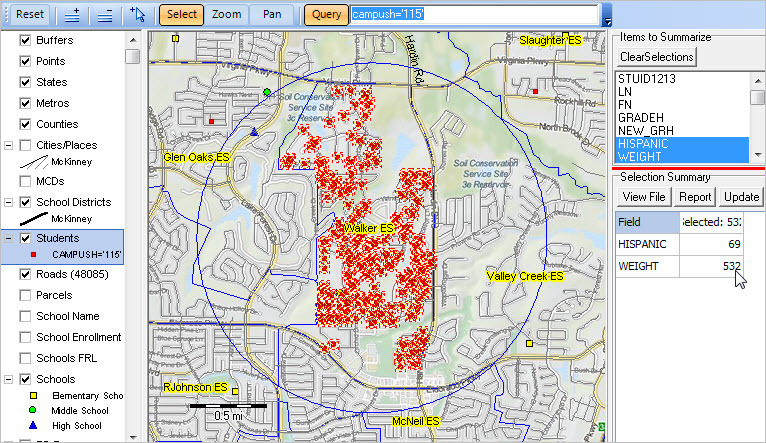 This view shows all students; note some are not selected as they are residents of Walker ES zone but do not attend that school. Census block layer has been checked on; census blocks are labeled with Census 2010 population. Patterns of income inequality as shown by Gini Coefficient by census block group. Block groups are the smallest geography for which richer demographic-economic data are available (from ACS). See more about Gini Coefficient and Income Inequality. View shows Median Household Income by census tract. Approximately 74,000 census tracts, averaging 4,000 population, cover the U.S. wall-to-wall. The graphic shown below illustrates integrating census tract/neighborhood level demographic-economic data from American Community Survey with attributes of students, schools and other geography. 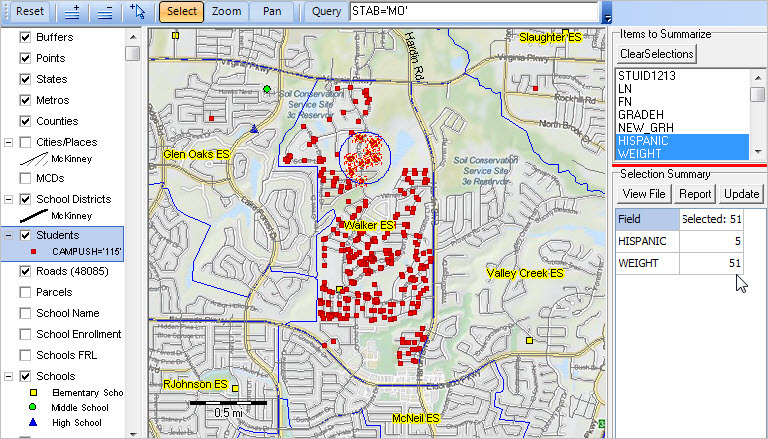 The view below shows use of the Site Analysis tool to select a set of 5 census tracts in the vicinity of McKinney Boyd HS (blue triangle marker). Any number of tracts can be selected, contiguous or otherwise. The subject matter items to be summarized are D001_13 (total population), D002_13 (male) and D002_13 (female) — ACS 2013 5-year estimates. More or different items could have been selected. The grid at lower right shows aggregated (across 5 tract) values for these three items. The view below shows the tracts dataset records in a CV XE grid/spreadsheet based on the above Site Analysis operation. This dataset extract is generated, and grid populated, when the View File button is clicked in the Site Analysis operation (see in Part 1 graphic at right). This grid displays the records selected in the above operation. These selected data records can optionally be exported for use with other software. 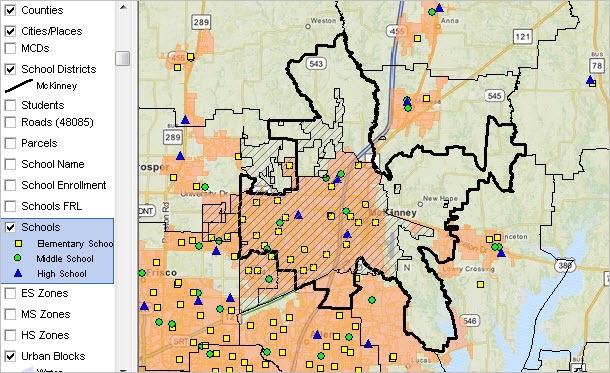 Summary demographic-economic profiles are generated for the above 5 census tract study area by clicking the Report button in the Site Analysis operation (see Part 1 graphic at right). The graphic shown below illustrates using visual analysis tools to compare/contrast school district characteristics in region/state. View, compare, query, rank school districts of interest using this interactive table. Data used in the graphic shown below are derived from the from ACS 2013 5-year estimates. Most demographic-economic data are developed for the whole population in an area. Data from the annually updatedACS School District Tabulation can help analysts and leadership better understand demographic-economic characteristics of children, and gain insights into needs, in a school district. See the McKinney ISD Children’s Demographic-Economic Profile by Universe of Enrollment. 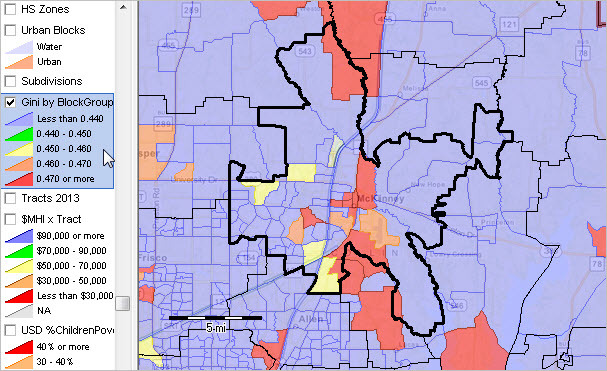 ProximityOne develops demographic-economic estimates and projections for individual school districts and component area geography such as census tracts. These data help schools and school districts examine how enrollment and the population in the district might change over the next several years. Projections are developed in several ways: by single year of age by gender by race/origin, by type of enrollment (public school, private school, not enrolled), and by demographic-economic characteristics. The street/road network used in the GIS project is from an augmented version of the TIGER digital map database. Each street/road segment runs from intersection to intersection creating opportunities for routing and transportation management. 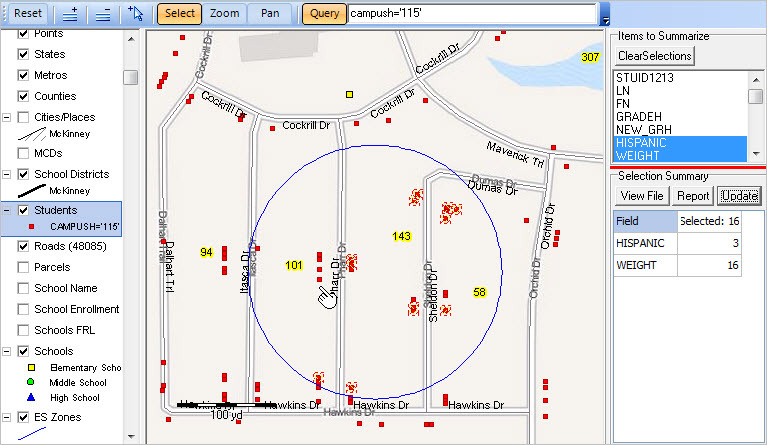 The CV XE GIS identify tool is used to click-on a street segment (see pointer). A mini-profile for this segment is displayed as shown in the graphic. The mini-profile shows that this is the 5500 block of Petunia Dr.
.. April 2015; updated monthly … current, monthly data on the employment situation are essential to assess recent trends. The only historical source of these data for all metropolitan areas, counties and sub-county areas is the Bureau of Labor Statistics (about these data). The civilian labor force, employment, unemployment and unemployment rate are estimated monthly with only a two month lag between the reference date and the data access date (e.g., February 2015 data are available in April 2015). Historical monthly seasonally adjusted and non-adjusted time-series data are available. Use tools and resources provided/described in this section to access and analyze these Local Area Employment Situation (LAES) data. See related Web page with interactive ranking table. The following graphic shows the February 2015 unemployment rate by metro. Use the interactive table in the related Web page to view, sort, compare employment situation characteristics by Core-Based Statistical Area (CBSA) — metropolitan and micropolitan statistical areas. Use the CV XE GIS software and LAES GIS project to create thematic pattern maps and integrate the employment situation data with other data. ProximityOne User Group members may install the LAES GIS Project at no fee and prepare thematic pattern maps like the one shown above and below. The map shown below shows February 2014 unemployment rate for each CBSA (a year earlier than the above map). Compare the maps and see how patterns have changed. .. 10 ways that data analytics will evolve in the next 10 years … Data Analytics help us know more about “where we are now,” trends/factors getting here and alternative future scenarios. Predictive analytical tools help management examine change — what will change where, by how much, and when. Cause and effect models can tell us how change might impact you/us; they help us examine options that might alter outcomes. Geographic Information Systems tools help us knit together disparate geographic, demographic, economic and business data and better understand patterns using visual and geospatial methods. Data Analytics had its origins in the 1960s/1970s with the availability of mainframe computing. Statistical packages, such as SAS and SPSS, enabled access to a range of Data Analytics tools by a wider array of potential users. Programming tools became more widely available creating customizable Data Analytics tools. Large scale machine-readable data became both available and processable for the first time. Data Analytics growth has been hastened by more accurate and detailed digital geographic data and geographic-based data. Data Analytics expanded with PCs/microcomputers growth. The Internet has created new ways to perform Data Analytics applications on-the-fly and reachable by a wider set of users. Data collection tools/methods have expanded. Advances in secondary data development has improved the ability to use cause and effect modeling, forecasting and impact analysis. 1. Organizations using Data Analytics effectively will experience improved growth opportunities relative to those not using these methods. 2. Data Analytics will continue to evolve as a set of integrated techniques and methods. 3. As Data Analytics use grows, a wider area of STEM-related occupations will expand in business and government. 4. TIGER/Line geographic data and digital map databases will improve in quality and scope enabling better location-based analyses using Data Analytics. 5. Use of API (Application Programming Interface) technology will play a larger role in Data Analytics as RESTmethods become more widely used. 6. Cause and effect, stochastic, simultaneous equation modeling will become more widely used as a core element of Data Analytics. 7. Annual time-series demographic-economic data will become available from the American Community Survey for use in Data Analytics modeling. 8. The role of Geographic Information Systems (GIS) tools, geospatial analysis and visual analysis will become increasingly centric to Data Analytics. 9. GIS tools will integrate more seamlessly with CRM, SCM and other Data Analytics methods. 10. Several challenges may impede Data Analytics evolvement including data linking (geocodes and file structuring) and data distribution architecture that makes data difficult to consume.